I got mail last Monday. I had a card in my mailbox telling that I could collect a package from the post office because it was too big to fit in through the hole in the mailbox. I don't quite understand why Amazon has to pack everything in big boxes. The book inside the package would have fitted very well. I already knew what was inside before I went to get the package Thursday. 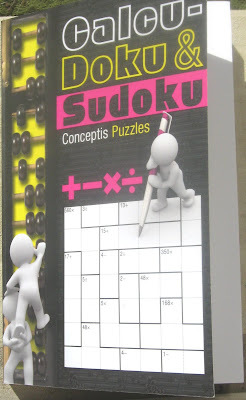 The new Conceptis CalcuDoku & Sudoku book has finally been published. I made the pre-order a long time ago. The book has 300 Calcudokus and 144 Sudokus. I have played the Calcudokus online on Conceptis website where I can choose to see the possible combinations and use pure logic. Solving them on paper was actually fun. I can write my partial conclusions to the margins. These are some of the easier ones. Here is the link to Amazon.com and Amazon.co.uk. This time I would have got the book cheaper from UK. With the current rates the price is lower not to mention the lower postal fee in EU. I think it is not totally out of the question that I could get the book from Finland eventually but the cost would probably be more. I always have to buy puzzle and math books online. There just is not demand here to make bookstores willing to keep the books in their supply. Tetsuya Miyamoto has vowed “not to teach children”.What he does instead is to set them a puzzle which, he says, transforms the brain into a vigorous problem-solving engine. The puzzle, of Mr Miyamoto’s own devising, is called KenKe*, which translates as “cleverness squared”. Mr Miyamoto’s theory is that the brain – of a child or adult – is failed by conventional teaching. By concentrating on a “third way” of problem-solving, he believes that the mind becomes a more potent tool for dealing with the rest of life, from main-stream education to the challenges of the workplace. *KenKen ™ Puzzles are used with permission of Gakken Co., Ltd and Nextoy, LLC. Puzzle content © 2008 Gakken Co. Ltd.
"I teach you nothing; I will only give you problems. Try hard or go home. There is no right way to the solution. Your way is the right way. Just keep trying and, through trial and error, you will get there." As a mathematics teacher I am not really sure if this really is advantageous in teaching mathematics. The students eventually develop the skills to solve the puzzles but do they have the ability to transfer that skill to the theory of math. According to the article his classes are very popular and it is hard to get in. I am horrified about the idea that some teacher would use this technique to all children. The fear of mathematics would surely get immense. 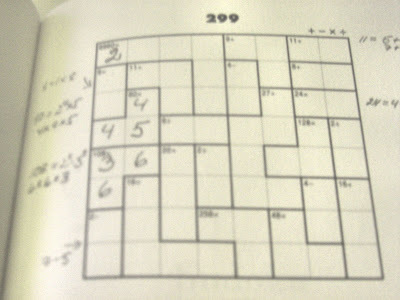 Well obviously the publisher of the book does not believe in the trial and error method because the next nine and a half pages contain detailed solving methods written by David Levy, the President of International Computer Games Association. These puzzles are lovely and I could see them as rewards for those students who have finished their usual assignments before others and need some extra problems. Is KenKen the Next Sudoku? asks Time (CNN). I think it could have been but the mistake was to trademark the puzzle. Now other puzzle creators can't use the name KenKen and these puzzles are provided by names like Kendoku (also this has been trademarked since kendoku.com has this warning now: Nextoy, LLC, the co-owner of KenKen® in conjunction with Gakken Co. Ltd., has informed me that they are also the trademark owners of the KenDoKu™ brand name). Kendoku.com was changed to Mathdoku.com. Also names Square Wisdom and MinuPlu are used. 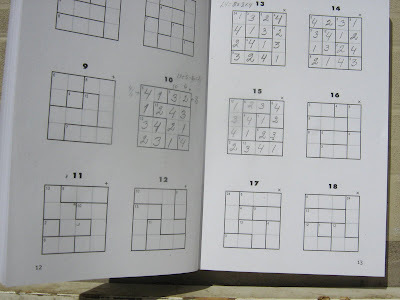 One of the reasons of Sudoku getting all the publicity was because all the puzzles were Sudokus regardless who made them! The Finnish Conceptis publisher could use the name Numeroku. It sounds so Finnish. The registration of a mathematical concept is against the mathematician in me. How would the science develop if scientists registered everything they come up with? I see lots of bigger mathematical questions in these puzzles regarding solvability and lots of things only a mathematical mind develops. From the educational point all I can say is: Use these for fun! Don't force anyone to solve them. If you want to try solving, the Conceptis Widget is on my sidebar. Good post! It would be cool if there were super easy ones for the younger kids to help with their maths skills. They love a challenge. Young people also need to learn logical thinking as early as possible.